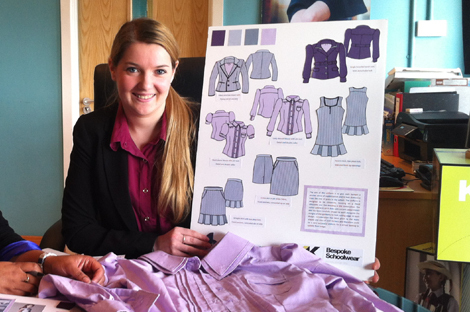 In partnership with the Society of Dyers and Colourists (SDC), KK Bespoke Schoolwear – which designs high-spec school uniforms manufactured in-house in Magherafelt, Northern Ireland –launched a competition open to design students and recent graduates in Ireland. The brief: to create a collection for the bespoke schoolwear market. The aim: to help highlight the lack of young blood entering the profession and, in particular, the discrepancy between university courses and the skill set that the industry requires. The competition’s winner was Toni Doherty, a fashion and textile design graduate from the University of Ulster, who has since been working for KK Bespoke Schoolwear. A year on after winning the competition, Doherty reviews what she’s learnt. Overall, I would say the journey in the past 12 months has been an exciting one. I have gained so much insight and experience of the schoolwear industry and how it works, and I have learnt so many things, but if I were to name a few, it would be creativity. Within schoolwear, there are a lot of parameters that govern what the end product can be, but this is where I learnt to improve my creativity and be smart with it. Giving a school an identity and portraying the image it strives for. There have also been so many different briefs, all requiring different fabrics and styles, and each school have their different needs, and taking their concept of fabric and design right through to the end product taught me a lot about the process as a whole, and I have a better understanding of the requirements of each garments that we produce. Another key thing I learnt was to work to strict deadlines and time restraints. At KK Bespoke Schoolwear, we feel that it is important to support the retailer. We will always help them present new product ideas and provide them with inspirational design boards and samples when necessary. As a result, my skills of working to time limits for these things have been sharpened. Although working to deadlines can be quite exciting, there are times when I would prefer to have more time to work on a design. I like to give a lot of consideration to the product’s end use and to think about the needs of the school, and so it can be quite frustrating sometimes when there isn’t enough time to carry out that thought process. I also have a much better appreciation of the work that goes on behind the scenes, from the preparation that goes into getting a sample ready, to preparing an order to go into production. There are so many things to consider, and I appreciate how important it is for all of the different teams with the company to work together. The thing I enjoy the most would be when we first get a design brief. I find that working out the needs of the school, getting a feel for what the desired outcome is, what the school or the retailer hopes to achieve through changing a design or introducing a new product, while still keeping the identity of the school in mind all to be so exciting. After this, a design board is put together with all the criteria and information that is needed, from which I then draw my inspiration. One of the major projects for us this year was the redesign of the school uniform for a very prestigious school, Millfield. One of the products they were looking to introduce was a pair of culottes for the junior girls; the brief was to produce a pairs of shorts that gave the illusion of a skirt. We worked on so many prototypes and I still wasn’t happy with any of them. One morning, however, I had a“eureka” moment. It is projects like this that I enjoy the most, I find it so rewarding to take my sketches, turn them into 3D prototypes, and then see the whole order packed and ready to go out to the customer. There have been many challenges along the way; the obvious would be designing new and exciting schoolwear products. Apart from this, I face new challenges every day because of the nature of my role. I work closely with all departments in the business –the role I play is the main link between sales and production and this requires solving issues and meeting the demands that require the two areas to be able to work together. When I started, I found it a challenge to understand the needs of both departments, but I have a lot more experience now, and can keep the two working in harmony. Over the next 12 months, I am hoping to gain more experience in CAD, which will support both the design and production aspects of the company. The training will be part of KK Bespoke Schoolwear’s three-year strategy, and I feel it will be a huge benefit and will increase my skills further. I am also hoping to work closely with the universities as we launch yet another exciting design competition. The brief will focus on printed fabrics, and I am hoping to get some of the best entries printed onto cloth that could be used in one of our designs. When I was studying, I found that the live projects were the most exciting way to learn, and I hope that this project will be able to encourage students to take their careers further within the textile industry, too.